The tiniest little silver feather and genuine turquoise stone all hanging from a Sterling Silver chain. Also available in a Gold filled chain with gold feather. Please specify in the notes. 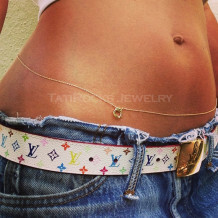 This is a custom made piece so please measure the area below your belly button where you would like the chain to hang. Please select your chain length from the drop-down menu.